Eye cancer is a rare malignant tumor, but if eyes are not reflex normally, eyeballs are prominent, or any masses are appeared in the eyes, one should go to department of ophthalmology for detail examinations for eye cancer. 1、Professional ophthalmologic examination: Doctors mainly check the location, size, shape, hardness, tenderness of the tumor and the adjacent tissue adhesion in the eyelids and orbits. Also, auscultation on noise near the eyelids and orbits should be done. In addition, doctors have to check if the cancer has local and distant metastases. If necessary, related doctors should be invited to have a combined consultation to distinguish if the tumor is a primary or metastatic one. 2、Check the eyesight, range of vision, direction and degree of the proptosis, movements of the eyes, pressure of the eyes, and fundus of the eyes in all sides. Have a scleral transillumination or radionuclide determination of 32P, or type B ultrasonic examination in a pinch. 3、Have an X-ray examination for the orbital bone and optic foramen. If economic condition is permitted, have an orbital venography, CT scan, or magnetic resonance imaging (MRI). 4、Have a general examination, and check the liver and renal function if it is necessary. 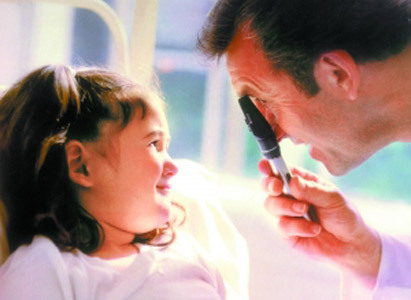 Experts from Modern Cancer Hospital Guangzhou remind that if one is diagnosed with eye cancer with related examination, he should go to regular hospitals for treatment promptly.